Look Ma, I’m Wearing a Print! 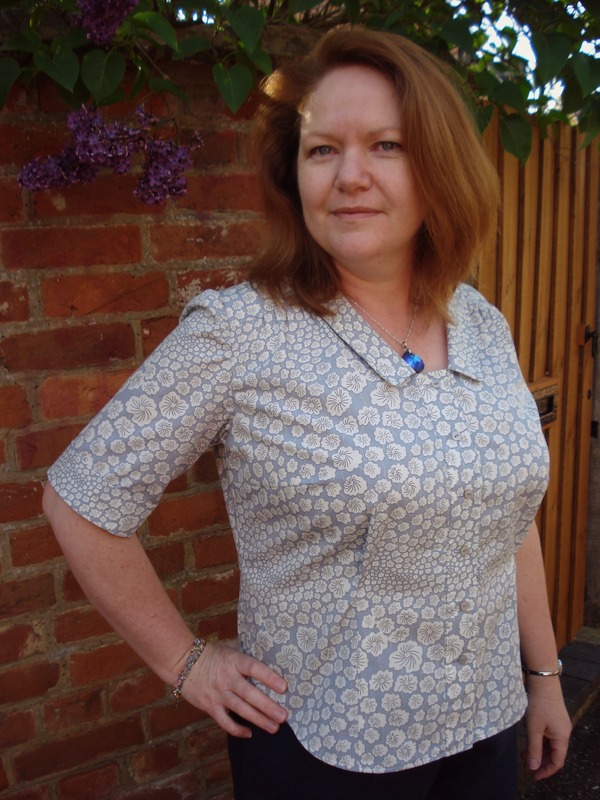 I’ve finished another self-drafted blouse! I really needed more tops & blouses, Me-Made-May has shown that pretty clearly! I have enjoyed it so far, especially showing off what Daughter No2 has in her wardrobe, but I’m having to repeat stuff. I used some of the pieces from the Midnight Blues blouse for this. The back yoke & collar, neckline and front bands are the same. The fabric I finally chose is a Liberty City Poplin. It is pretty sturdy and very crisp, so perfectly suited to a more structured style. I love the colours, the flowers are off-white and the ground is a blue-grey. The pattern has alternating bands of small & larger flowers, so I lay the pattern pieces so that the smaller flowers lined up with the waistline. 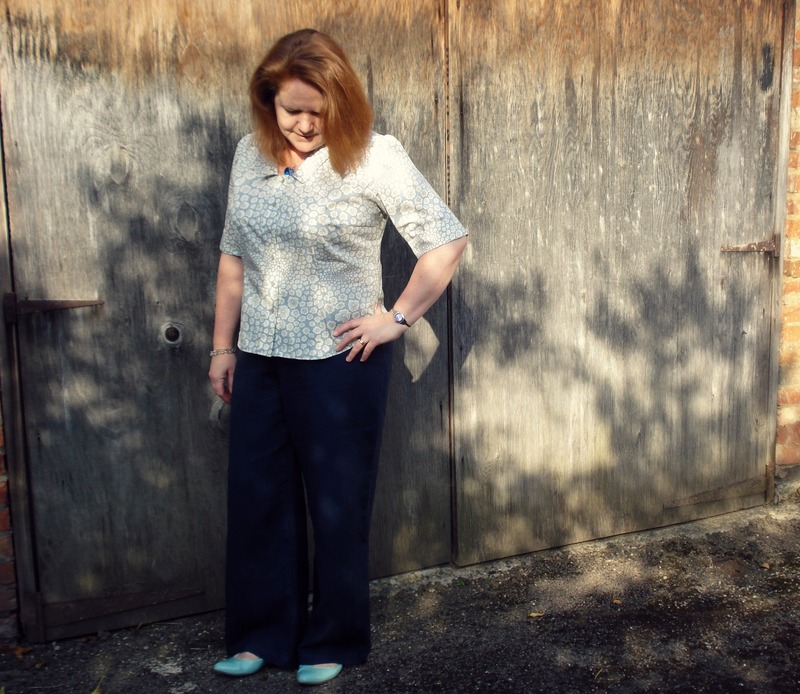 The hope is that it looks like I have more shape in that area – not sure if that’s worked! The front has a yoke at the shoulder that the bodice gathers into. I converted the large shoulder bust dart into 3 areas, first the gathers at the yoke, then a 5cm underarm dart & the remainder went into the waist dart. This was sewn as a dart tuck instead of a full double point dart. I wanted more of a relaxed look, this fabric is quite sturdy, and while that lends itself to a more structured style, I wanted to be able to relax in it! The back also has a yoke, but there are no gathers here this time. A central back panel & two side panels make for a fitted look, something you need when using a sturdier fabric. This stuff does not drape! I curved the hem a little more than I have on previous patterns, mostly because it was going to be closer fitting. 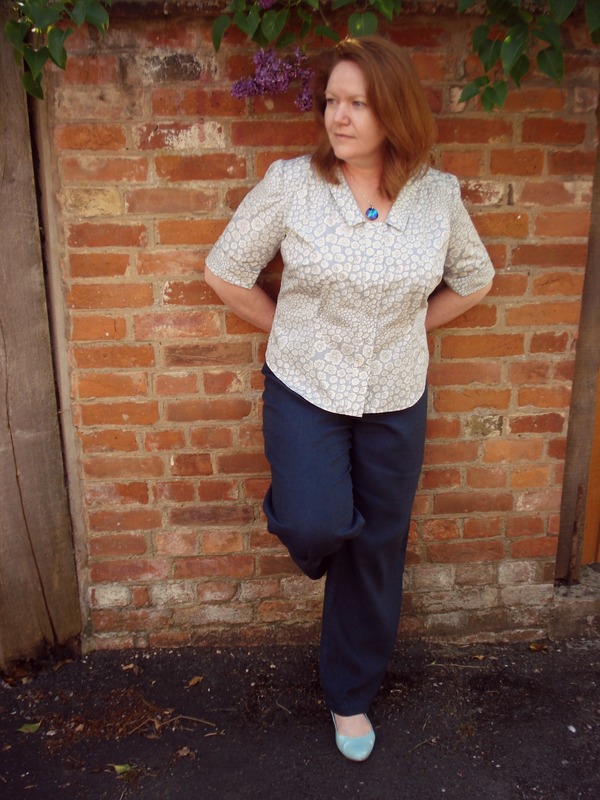 I love how the blouse looks with my dyed linen trousers, it also looks good with jeans but slightly all too pale with light linen. Perhaps I just need more summer, that’s when the pale colours work! I recon this is a good pattern, now I have another two still to toile, not to mention all sorts of other things to make. Your blouse is so pretty. 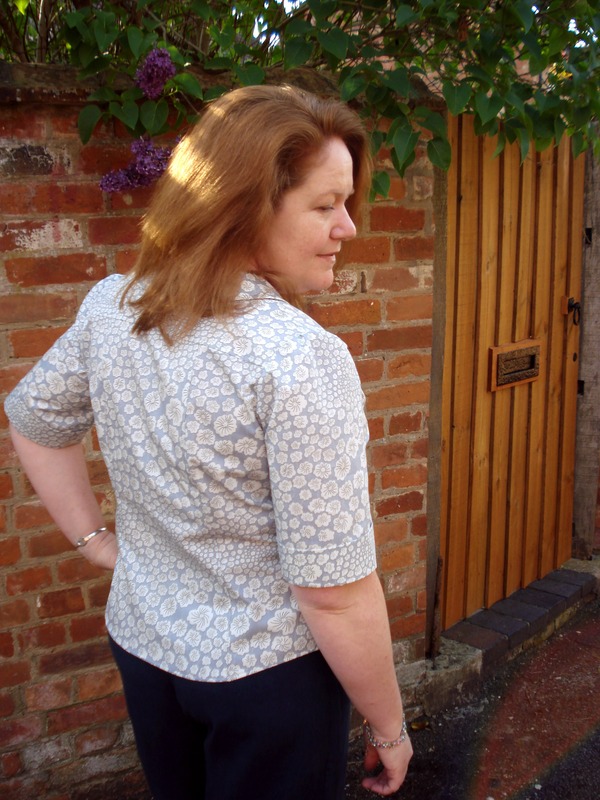 I love your placement with the smaller flowers at the waistline, a beautiful subtle detail (and very shapely). I must admit that I was slightly disappointed that this was self drafted – I want one! I like this a lot. The print is subtle and the small collar isn’t as overwhelming as a standard blouse collar can be. A really lovely blouse. And very shapely too! Lovely blouse! The fabric is gorgeous and you’ve done such a great job with shaping. Looks great. Very nice! 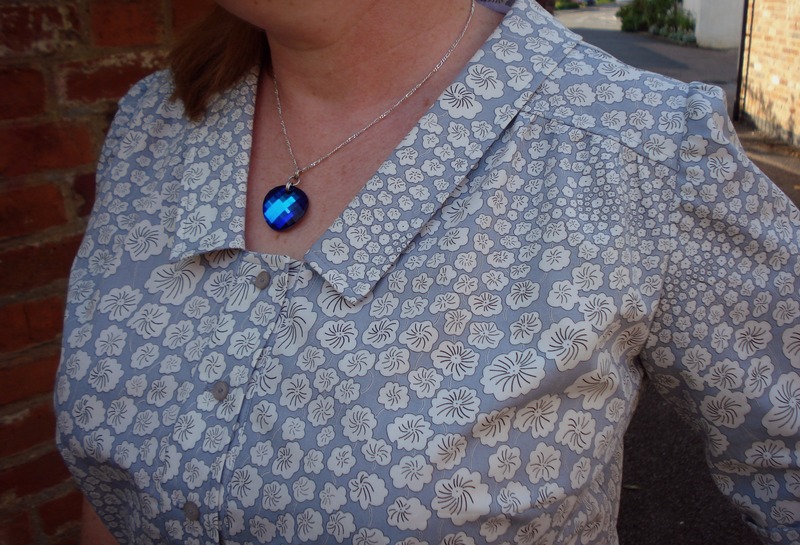 I really like the collar on this blouse, very fetching for the summer! oh, and by the by, your daughter is going to look spectacular in that Snowball dress! I think it suits her type and shape exceptionally well! Amazing job on the blouse drafting, it is beautiful on you. I have realized I need more tops through MMM, I have a bit too many dressy items that don’t work for my day-to-day life. I recently found your blog and really enjoy all garments.